The white oak tree (Quercus alba) is a long-lived tree used for shade in landscapes and it is one of the most important timber species in the United States. The “National Audubon Society Field Guide to Trees” reports that the white oak has the nickname stave oak, since its wood is integral in making barrels. Shipbuilders in colonial times valued the wood as well. Today, white oak goes into products such as flooring, furniture and beams. The white oak’s range includes most of the eastern United States. The tree is vital to the animals that exist where it grows. While some of the biggest white oaks measure as tall as 150 feet, the average tree of this species grows between 80 and 100 feet high. The trunk's diameter can exceed 4 feet and the tree takes on a broad round look when mature. On some individual white oak trees, the lower branches become gnarled and grow horizontal to the ground. While they aren’t commonly found in nurseries due to their slow rate of growth, white oaks are prized landscaped specimens for the shape of their wide-spreading branches. 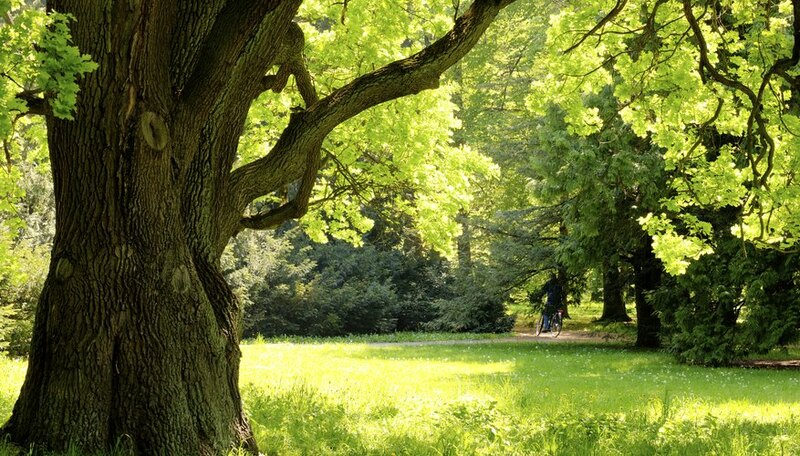 The slow-growing trees are also long-lived with specimens surviving for hundreds of years. The white oak is difficult to transplant successfully due to its slow growth, making a full-grown oak even more valuable. The leaves of the white oak are about 5 inches long and 3 inches wide, with from seven to nine round-ended lobes on each leaf. The upper sides are a blue-green color, with the underneath surface a whitish shade of green. The white oak's wood when first cut is light beige to almost white, an aspect of the tree that gives it its name. The grayish bark features grooves and rectangular scales, with deep grooves appearing at the bottom portion of the trunk on older white oaks. Quercus alba produces both male and female flowers. The pendulous clusters of yellow-green male flowers appear first and are followed by the spiky, reddish female flowers. In autumn, the leaves turn a reddish color, ranging from brownish red reddish purple. 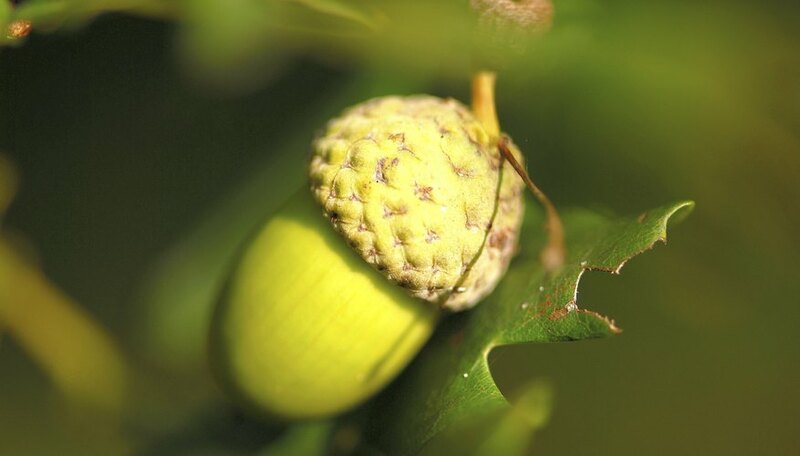 The acorns produced by the white oak are a major source of food in the tree's ecosystem. These fruits are about 3/4 inch long, egg-shaped with a shallow cap and need but one season to grow to maturity. A wide array of birds including turkeys, pheasants, grackles, woodpeckers, jays, thrushes and nuthatches depend on them in the fall for nutrition. In addition, mammals as large as the black bear and the deer and as small as rabbits, voles and mice include the acorns in their diets. Populations of some species fluctuate in proportion to the amount of white oak acorns available each year. 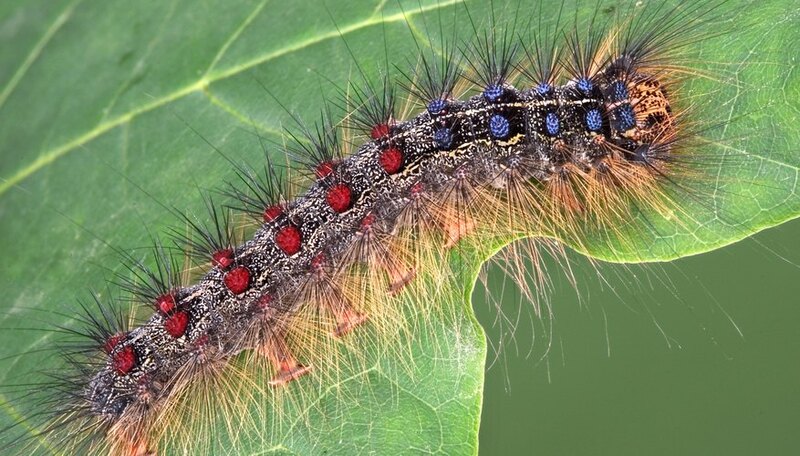 A variety of insects will launch attacks on a white oak, among them the larvae of the gypsy moth and other moths. The caterpillars, when present in large numbers, may defoliate sections of the tree. Other bug pests like the oakleaf caterpillar and orange-striped oakworm can devour foliage. 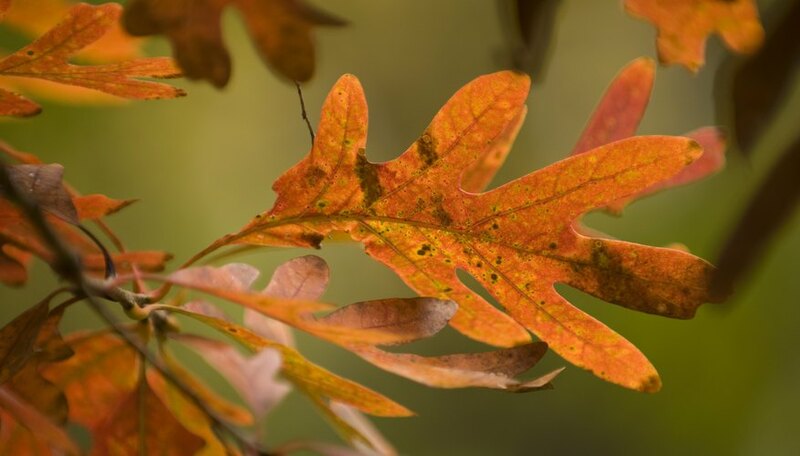 Economically, the most significant insect that bothers white oak are the wood borers, which can cause defects in the lumber of still-standing trees. Scales are a group of insect pests that feed on sap and cause fungus to grow on the trees. A common white oak tree adaption to insects feeding and laying eggs is the development of galls. Galls are areas of irregular tissue growth that can become harmful to the tree over time. The white oak tree ranges from southern Canada to Florida and as far west as Minnesota. It is the Illinois state tree, as well as the state tree of Maryland and Connecticut. It’s called white oak because newly-cut wood appears light in color and is nearly white. While not considered an edible species, historical evidence suggests that native Americans consumed white oak acorns after boiling them. Lindell, John. "Facts About White Oak Trees." Sciencing, https://sciencing.com/white-oak-trees-6521703.html. 09 October 2018.